The other day, we passed along 11 paid iOS apps that are free for a limited time. Today, we have another 12 paid apps for your iPhone or iPad that won't cost you one red cent, at least not at the moment. Since we don't know when the cash register will get turned back on for each app listed, you need to take to heart these two words: Don't procrastinate! Check out the apps listed below; if you see any that would improve your iOS experience, you should download and install them right away. If you click on one of the links and see a price instead of the word "Get," it is too late and that app is no longer free. With that in mind, let's begin. If you want an improved experience for your contacts application, the first app on the list is Simpler Contacts Pro. You can save a nice chunk of change here, because the app is normally $4.99. The app will merge all duplicate listings, backup your contacts with a single tap and allow you to quickly search for a particular name. Normally $1.99, Cut The Buttons is free for a limited time. Like the title suggests, this is a game that has you handling a virtual scissor to cut buttons. You keep cutting until you miss three scraps of material that contain a button. WeightDrop Pro is usually 99 cents, and tracks your poundage. You can set a target goal, either higher or lower, and follow your progress. The app will also recommend a healthy weight based on your profile. If you're looking for a new weather app, Blue Sky Weather might end your search. Usually 99 cents, the app will give you the current weather conditions, forecasts, and if rain is coming to your area you can arrange to receive an alert on your Apple Watch. If you can never get organized when packing for a vacation, and end up leaving some important items back home, iReadyTrip is tailor-made for you. With the 99 cent price waived for a limited time, you can get this useful app for free. It provides you with a checklist that you can use to make sure that everything is packed. It comes with 250 items already listed, divided into 12 "packages." Web Explorer is a third-party browser that includes tabbed browsing, a "super fast" full screen, a central media player, and a feature that allows you to save sites to view once you are offline. With an in-app purchase, you can add an ad blocker that will prevent 3000 ad servers from plying you with advertisements. The app is usually 99 cents. DMD vClone is regularly priced at 99 cents. Free for a limited time, this is a cool special effects app that allows one person to be seen multiple times in one video. For all of you budding hypochondriacs out there, there is Diagnose. Normally $1.99, this app allows you to select a medical condition, and find out what the chances are of you having that condition both pre-test and post-test. The test is a simple checklist to see what symptoms you have. This does not replace a trip to the Doctor! Rotate Video 360° will correct the orientation of your videos. You can save $2.99 by installing this app for free. After being rotated, the videos are sent to a private folder by default. You can manually have them go into your Camera Roll. Usually $2.99, 3D Earth is a combination world clock and weather app that covers millions of cities globally. It offers 3-hour and 15-day forecasts. It also supports 3D Touch, and the Apple iPad Pro. Save 99 cents by installing mText2Speech while it is free. This is an app that will translate both spoken and written words, and supports over 90 languages. 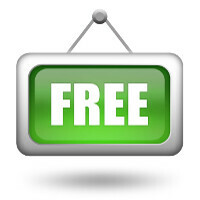 The last freebie on the list will save you $4.99 if you install it while it is free. VoxBeat takes a beat that you are singing and turns it into a drum machine track. For all of you aspiring rappers out there, this is the app you need to download and install now. So there it is, 12 apps that won't cost you anything to use on your iOS device. Surely there is at least one app among the 12 that you will find useful. And the best part is that you saved as much as $26 by taking advantage of the developers' largesse. Are you sure it is free i wand to try out SIM contacts PRO and she want 5 buck.